NBA feuds are always fun because they take place on and off the court. Social media obviously plays a huge part in the "beef" continuing off the court and we saw an example of that Tuesday night. The Trail Blazers squared off against the Thunder and during the game, Russell Westbrook was talking trash with Damian Lillard and Jusuf Nurkic. 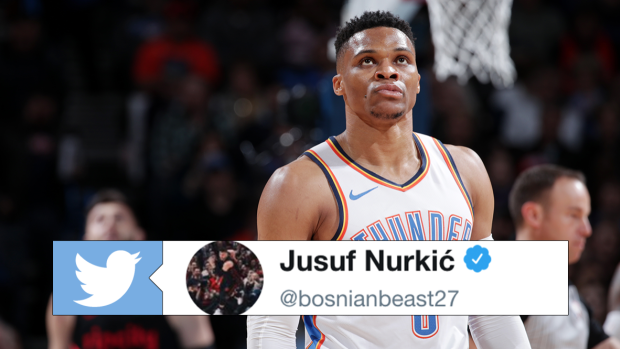 The trash talk continued after the game, to which Nurkic responded by giving Russ this incredible nickname. "Westbrick" is a somewhat appropriate nickname for Russ due to the fact that he's shooting just 41.6% from the field and 24.2% from three. Westbrook obviously got the last laugh as the Thunder won the game, but the nickname is forever, especially now that it's on the internet for the world to enjoy.